As midsummer as it gets, August 16th, and the rain it is a-gently-raining as me and him saddle up at the Sham o' Martle. Front wheels pointed over the A14 bridge, off we push for a preprandial seven mile saunter, a spin in the park next to the recent Bawdsey sportive. Next stop, the 'Swich. Safe and secure outside the library, it's down a door or two to number 12, the landmark that is the Golden Panda. Nope, that was donkeys' ago. Since that time it's morphed from Artista to Lemon & Mint to Chaupatty, none of them lingering too long. 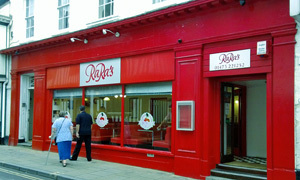 Now, with its raspberry red frontage, we find RaRa's, an ice cream parlour which threw open its doors in, er, December. Brrr. Well done for making it through to August. Jukebox? Tick. Booths? Tick. Coke ads? Tick. Film posters of 12 Angry Men and Attack Of The 50 Foot Woman? Tick. Savoury somethings? Not as such. RaRa's is all about sweet treats, from the knickerbocker glory to the cherrybomb and every dairy good and bad thing in between. Scanning the menu pix, Andy goes for the bananacakes (yum, pancakes) while the lemon & ginger delight is delightful. To balance out that evil sugariness, he has the root beer and I have a cherry Coke. You can almost feel the next Denplan payment leaving your account. One point away for not having a proper coffee machine -- wouldn't some spluttering espresso noises and cappuccino steam add to the atmosphere? -- but one point added for the always welcome free WiFi. I gather it's packed at the weekends. Let's hope RaRa's lasts. If it was a car -- Plymouth Savoy. If they were passing by -- Robbie Coltrane.